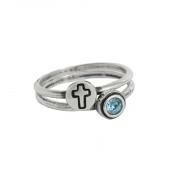 "Christian Jewelry, Silver Christian Ring, Double"
Religious jewelry can come in different styles, but we think simple and meaningful is best. These custom rings can be used as confirmation rings or baptism jewerly ~ whatever the occasion the ring you design will be special. A special moment should be commemorated with a special gift. Whether you are designing a custom communion ring or just making a special piece of christian jewelry, this simple ring will hold special meaning. 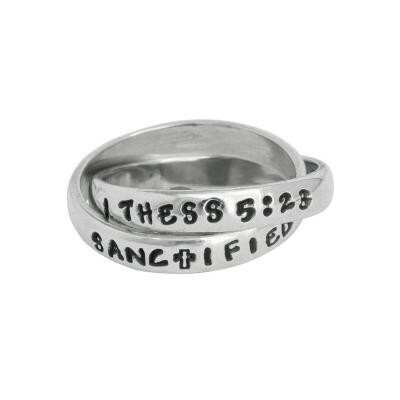 The simple and sophisticated confirmation rings can be stamped with a person's name, their confirmation verse, a date, a special word - whatever would have the most meaning for a special day in the confirmand's life or to celebrate a person's faith. 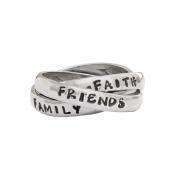 Dimensions: The sterling silver bands are approx 3mm wide and can be stamped with up to 12 characters/spaces. Please note the bands are interconnected and will always move around. The same band will not always be on top. Prices include stamping. Because this item is customized all sales are final. Sorry ~ we cannot stamp on the inside of the bands. Sizing: When determining your size, we ask that you give us a size that is a snug but comfortable fit. If you are unsure of your size, you can purchase a ring and select ring sizer in the dropdown. We will mail you a sizer and instructions on how to email us your size.